Step out in style with the Aztec inspired Ryn Collection, featuring enzyme-washed canvas fabric with stripe print in sepia brown, bright white, and ebony. Accented with southwestern medallions, brown leather, and antique brass trim. Lined with solid caramel fabric. Ryn Rucksack, part of the Bella Taylor Collection by VHC Brands. Pack gym clothes, books, a laptop (can hold a 13 inch MacBook) or snacks in this comfortable bag for an active agenda. Ryn Shoulder Tote Bag, part of the Bella Taylor Collection by VHC Brands. Pack all you need for a day on the go with the clean and classic Shoulder Tote bag! Mid-sized, lots of room for your wallet, make up pouch, snacks, small journal, etc. 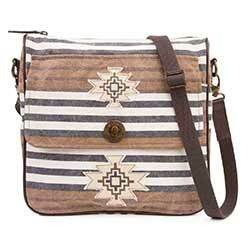 Ryn Wanderlust Tote Bag, part of the Bella Taylor Collection by VHC Brands. Travel in style with this large bag, fitted with a luggage strap in the back so you can thread to your suitcase. Ryn Weekender, part of the Bella Taylor Collection by VHC Brands. Pack everything you need for the weekend and then some with this oversized handbag, which also has an adjustble crossbody strap for hands-free travel. Ryn Wide Tote Bag, part of the Bella Taylor Collection by VHC Brands. For a casual day on the go, toss it all in this extra large tote, perfect for shopping, work, school, or a day at the beach!